What Are Veterinary Prescription Labels? Veterinary prescription labels guide the proper administration and use of medications. Veterinary practices, animal clinics and more use veterinary prescription labels to communicate and guide more effective patient care. Veterinary prescription labels help the veterinary staff dispense medications safely and accurately. They also assist pet owners, communicating proper storage and care giving, once the pet is at home. 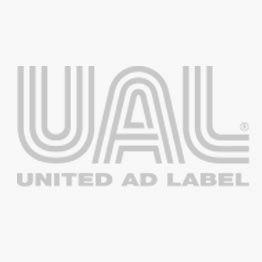 United Ad Label Veterinary prescription labels are designed to quickly convey information to the caregiver. The flexible paper is easy to use and wraps around small syringes without flagging. Plus, UAL stocks numerous sizes, styles and messages designed to meet staff and patient needs. CAUTION MAY CAUSE DROWSINESS, Medication Application Label, 1-5/8" x 3/8"
Do Not Flush Unused Meds , Medication Instruction Label, 1-5/8" x 3/8"
Do Not Handle If Pregnant, Medication Instruction Label, 1-5/8" x 3/8"
DO NOT USE ON CATS, Medication Instruction Label, 1-5/8" x 3/8"
FOR EXTERNAL USE ONLY, Medication Instruction Label, 1-5/8" x 3/8"
FOR VETERINARY USE ONLY - KEEP, Medication Instruction Label, 1-5/8" x 3/8"
GIVE ORALLY Label, 1-5/8" x 3/8"
GIVE UNTIL GONE, Medication Instruction Label, 1-5/8" x 3/8"
GIVE WITH FOOD, Medication Instruction Label, 1-5/8" x 3/8"
Heartworm Medication Dispensing Label, 3" x 1-5/8"
IV Medication Added Label, 2" x 3"